Gary Kleinman teaches in the School of Business at Montclair State University. He has a CPA license and obtained his PhD from Rutgers University, Newark, NJ. Dr. Kleinman has an extensive research background, some of his many research articles have appeared in the Journal of Accounting, Auditing and Finance; the Journal of International Accounting Research; Review of Quantitative Finance and Accounting; Research in Accounting Regulation, and Accounting, Economics and Law: A Convivium. 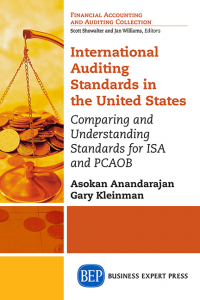 In addition, Dr. Kleinman has also co-authored two books on auditing, an academically oriented book and a practitioner-oriented text concerning PCAOB and SEC standards on auditing.